The script for How It Ends – by Brooks McLaren – was on the 2010 Black List of highly regarded yet unproduced screenplays. Now that it has been made, it would be interesting to make a comparison between the original Black List script and the final version used here, because this is yet another occasion where the initial hype is very far from justified. For one thing, the characters are paper thin, and barely fleshed out beyond their screenwriting 101 archetypes. Will is a lawyer but his occupation hardly matters as he has no personality or recognisable character traits to make him stand out in any meaningful way. Tom is the classic overbearing father, convinced no one is good enough for his “little girl” and initially dismissive of Will’s presence and minimal capabilities (during the encounter with the police cruiser, he can’t even use a gun properly). Of course, the pair will bond over time, and mutual respect will be formed, but here it happens almost as an afterthought, as if McLaren had forgotten about it, and then realised he needed to tick that particular narrative box before it was too late. The secondary characters are even less interesting, there to help move things along as and when necessary, though Ricki does add a little flavour to proceedings (though this is largely due to Dove’s performance, which looks out of place because she’s actually trying). The narrative relies on too many moments of convenience – Tom talks their way through a military roadblock, Will convinces a town sheriff to let them through a barricade – and it creates danger at nearly every turn, with almost everyone they meet on the road out to rob them or kill them or both on nearly every occasion. This wouldn’t be so bad if director David M. Rosenthal was able to make these sequences tense or suspenseful, but there’s much that goes wrong in the editing of these sequences, so much so that they lack any appreciable impact, leaving them to slot into a movie that proceeds along a steady, measured pace for much of its running time. The mysterious occurrence on the West Coast goes unexplained for the most part (though there is a conspiracy theory trotted out near the end that is meant to sound plausible but isn’t), and its effects vary from late scene to late scene, until the movie climaxes with a final image that will literally have viewers saying, “This is how it ends…?” But by then, it will have failed to matter long before, making this an apocalyptic event that could have done us all a favour. Rating: 4/10 – with nods to the breakdown of civilisation that is always expected to occur in these occasions (but within a day or two – and country wide? 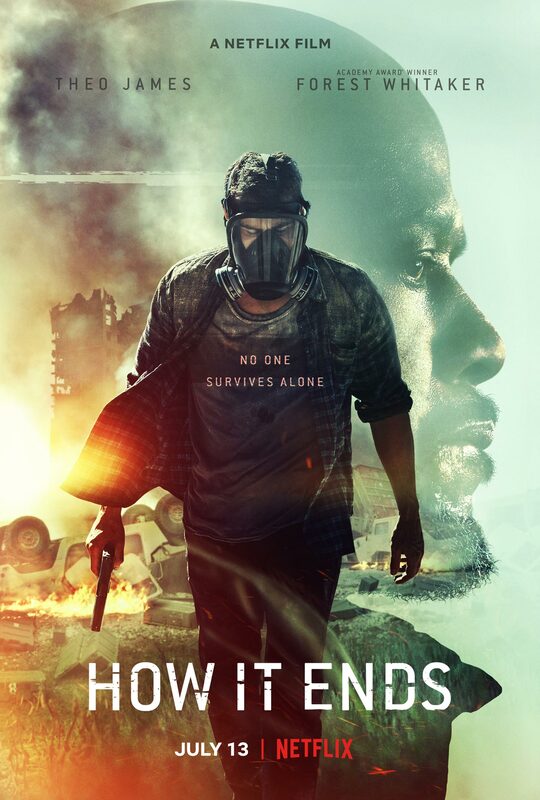 ), How It Ends strives for relevance where it doesn’t need to, and aims for resonance where it doesn’t have to, making this a turgid trip through a less than convincing post-apocalypse Twilight Zone; with no one to connect to, and a series of repetitive encounters with people who have conveniently “turned bad” at the drop of a hat, the movie struggles with a number of ideas it doesn’t know what to do with, and instead of trying, it settles for being banal and dramatically commonplace.